Elwood P. Dowd: Yes, it is. Mailman: I gotta special delivery here. Elwood P. Dowd: Oh, that sounds interesting. Elwood P. Dowd: Dowd. Dowd's my name. Elwood P. Let me give you one of my cards. Mailman: That won't be necessary sir. Just, eh, sign right here. Beautiful day. Elwood P. Dowd: Oh, every day's a beautiful day. Q: Why does Elwood rip up the envelope without even reading what's inside? Q: Did this film inspire "Donnie Darko"? 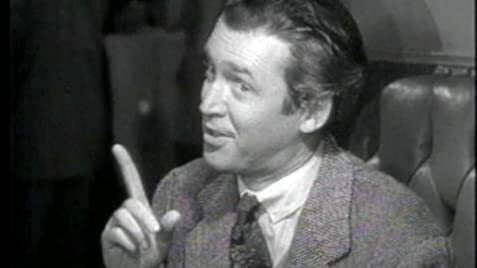 James Stewart was a down to earth, decent man whose personal life was as honorable as the lives of George Bailey and Jefferson Smith - but he admired Elwood P. Dowd, an alcoholic dreamer with an invisible giant white rabbit as his best friend. Not what you would expect of a man who piloted B-17's and led giant raids over Germany in WWII. Elwood's attraction for us is perhaps what attracted him so much to James Stewart. Elwood is happy with himself and his life and even more importantly, he makes others happy with their lives. That is the great magic of Elwood and Harvey: they make others happy and they bring peace and a measure of contentment to almost everyone who know them. 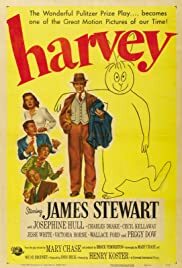 I have seen another version of Harvey with Art Carney and it was quite good, but lacked the sense of magic that is a benediction in this version of Harvey. In the Carney version, you can see Harvey - he is a giant white rabbit - and seeing Harvey takes much of the magic away. When you watch Jimmy Stewart, you never really know if Harvey is real or not. You know that Elwood thinks he is real and you know that Elwood's family thinks Elwood is crazy. After watching for a while, you don't really care if Harvey is real. Elwood is real and it is his belief in Harvey and what Harvey represents to him that endows him with such sweet and gentle charm. Harvey is his rejection of the harshness and materialism of the world. Harvey is a charming, magical masterpiece of kindness and goodness that somehow never becomes maudlin. Elwood and Harvey do not feel sorry for themselves and they most certainly do not expect you to feel sorry for them either. If anything, Elwood feels sorry for the rest of the world and he does not understand how everyone can't see as clearly as he does. For in his world, we are all brothers who should love as generously and kindly as Mr. Stewart's Elwood P. Dowd. 163 of 178 people found this review helpful. Was this review helpful to you?